Granite Viewpoint: Electricity in NH - Did Massachusetts voters just save PSNH ratepayers some money? Electricity in NH - Did Massachusetts voters just save PSNH ratepayers some money? Occasionally, events and circumstances interconnect in unexpected and intriguing ways. The election of Scott Brown to the US Senate by Massachusetts' voters could give us another example of this and may have a surprising impact for New Hampshire. The economics of PSNH's scrubber project were looking a bit tenuous in light of increased costs, lower natural gas prices, and looming carbon pricing legislation. Last week's election may end up changing all that. In fact, it may even make the cost of electricity from a "scrubbed" Merrimack Station relatively inexpensive for PSNH ratepayers. “A large cap-and-trade bill isn’t going to go ahead at this time,” Senator Dianne Feinstein, a California Democrat, told reporters in Washington yesterday. The cap-and-trade bill may not be completely dead, but most pundits believe it's at least mostly dead. This follows the Republican takeover of a seat formerly held by Democratic Senator Ted Kennedy in Massachusetts. Impact on the environment notwithstanding, the death of cap-and-trade legislation could save PSNH ratepayers a hefty sum. Carbon emissions were estimated to cost $20-30 per ton and Merrimack Station alone emits over 3.5 million tons of carbon each year. As a sort of plan B, in case the cap-and-trade bill failed, the EPA has been threatening to regulate carbon emissions itself under its Clean Air Act authority. The EPA recently classified CO2 as a dangerous pollutant and appeared poised to enact new regulations on emissions. With last week's election, congress may now block the EPA's move to regulate CO2. At a minimum, the election results will make it tougher for the EPA to claim new regulatory authority. That means "plan C" may be called into action. Under plan C, the EPA would tighten regulations on other pollutants that coal-fired power plants emit, namely sulphur dioxide and mercury. The idea is that tighter regulations would increase the cost of making electricity with coal, and thus reduce the use of coal as a fuel for making electricity. This would be easier to do politically than enacting new legislation or claiming brand new regulatory authority over CO2, and would likely still result in a large decrease in CO2 emissions as a side effect. Like many others, Bernstein Research analyst Hugh Wynne thinks the election of Scott Brown to a Massachusetts Senate seat last week is a death knell for cap-and-trade legislation, at least under this administration (we don’t necessarily agree with this assessment, but more about that later). And like others, he points to new EPA regulations as being an alternative source of curbing greenhouse gas emissions. Only instead of the EPA’s CO2 endangerment finding, it’s the proposed tightening of sulphur dioxide emissions rules that Wynne says could affect US coal-fired power plants so much that US demand for coal goes into ’secular decline’. And there's the real twist. 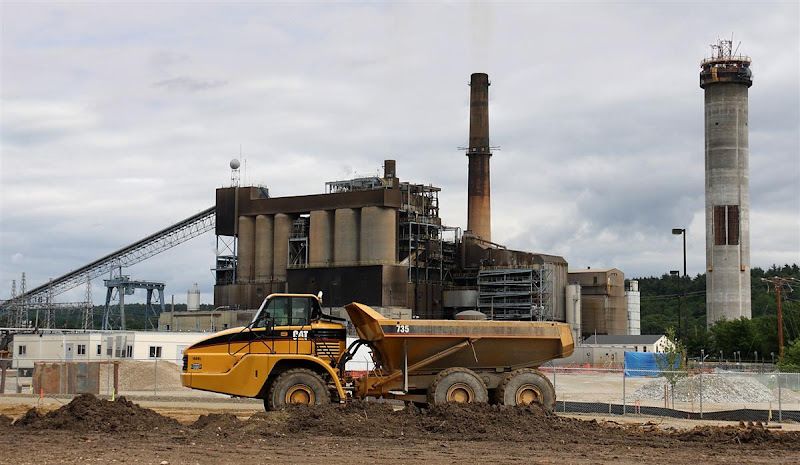 Merrimack's new scrubber is expected to limit emissions of both sulphur dioxide and mercury to amounts that are well below any future EPA limits. The plant will still be spewing out plenty of nasty CO2, but it should have no trouble complying with even the most stringent EPA regulations on sulphur dioxide or mercury. So if SO2 and mercury regulations are the path the EPA takes to reduce coal-fired power plant emissions of CO2, that could set up a second windfall for PSNH ratepayers. As non-scrubbed coal plants begin limiting output or shutting down, coal demand around the country would likely decrease. That could result in reduced coal-prices and thus a lower cost of electricity for coal-fired (and scrubbed) power plants like Merrimack Station. I know there are a ton of 'ifs' in the scenario described above, but it doesn't seem that far-fetched from a political standpoint. Personally, I think some sort of carbon pricing scheme would be a good thing overall. But if climate legislation does fail, I suppose it wouldn't hurt for PSNH ratepayers to get a little windfall. As usual, when it comes to electricity in New Hampshire, we're sure living in interesting times. I need to check in with you more often; this is good stuff that I'm only just getting around to stealing ... er, linking to at Granite Geek!